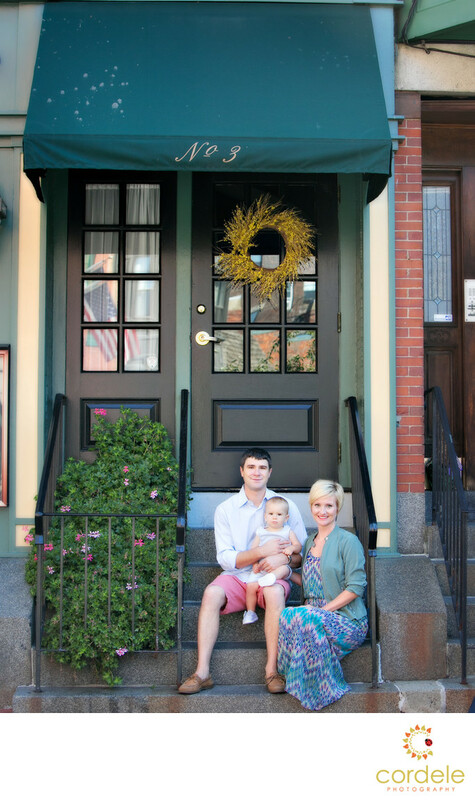 A family photo outside a restaurant in the North End of Boston. A mom and dad sit proudly in North Square in the North End for their first family photo in Boston. Having relocated from California this couple reached out with a photoshoot idea to really show off their new home to family. It was amazing to be able to be the photographer that took those photos of the milestone in their life as well as the babies first birthday cake smash. We went over to the lawn by Christopher Columbus Park and sat down and put the cake out. People stopped to stare and were so excited to watch the little boy smash the cake!